Lowdown: Further episodes from the Old Man’s War universe. 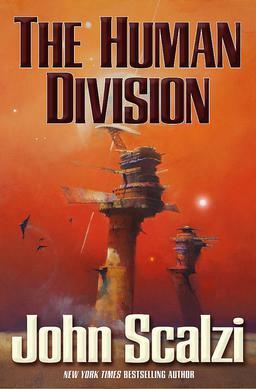 Despite the fact of John Scalzi being my favourite author of fiction being public domain knowledge for years now, and despite me buying his latest book – The Human Division – on its release day, it still took me months before I actually got to read it. There are two reasons for that: first, The Human Division happens to be a very long book and I have become long book averse (even if, as Scalzi points out, it is but a short story in comparison with the likes of A Game of Thrones). And second, although I like the Old Man’s War setting and although Old Man’s War was the book that introduced me to Scalzi, that book and its sequels happen to be my least favourite Scalzi books. Before getting to the book itself, I would like to point out that perhaps even more interesting than the book itself was the way in which it was released. Months before the book was released, its various chapters were released one by one in ebook form, one a week over twelve weeks. Then there was a pause, and then the book and the full ebook were released (it is the latter that I bought and, eventually, read). As far as I am aware of, this is the first time a book gets released this way, at least from a writer of a calibre as high as Scalzi’s (the calibre of the latest science fiction author to win a Hugo for best book). One has to remember Scalzi has a knack for frontier breaking, with an ebook of his also happening to be the first from Tor to come without DRM. Surely, you would think, that unique release pattern would be reflected in the book’s structure. Indeed it does: The Human Division is made of 14 stories/chapters/episodes/whatever-you-want-to-call-them, the previously mentioned 12 plus two bonus ones that were also made available to those that did their weekly shopping before. The stories take place shortly after the events of Old Man’s War core trilogy (Old Man’s War, The Ghost Brigades, and The Last Colony) concluded and follow the further adventures of some previously mentioned characters, with the notable absence of John Perry, as well as some newly introduced ones. Each chapter/episode/whatever tells its own story and can therefore be reasonably sold on its own, but the stories have ongoing themes. The core theme has us following a bunch of B Team participants from the human colonial side as they embark on diplomatic duties to address the post John Perry universe: a universe in which the majority of species - but not the humans - have united into the Conclave, and a universe in which the humans from earth are no longer aligned with their fellow humans in the colonies. As the book tells us at its very beginning, the human species is not expected to make it past three decades under these conditions. There is a big “but” with The Human Division. That “but” is to do with the not so minor issue of the book not having an ending, obviously leaving us hanging in for a sequel that may come in some future year (but not next year; August 2014 will see an unrelated book release from Scalzi). I can partially forgive the sin given The Human Division’s episode like construction, with each episode having its start and its ending, but still – there is no overall ending to be found here. In order to avoid blooping I will settle with mentioning each of the stories here is formed to thrill. Scalzi tends to say he can "lose" a book when its first two pages are less than gripping; he makes sure the readers of The Human Division do not encounter such a problem. Indeed, the whole book "reeks" of classic Scalzi: the sense of humour I like so much, heavy on the sarcasm. Or the values I agree with, reflected in numerous women filling key roles and in men not afraid of doing the lesser tasks (e.g., going down to the guts of a carnivorous plant in order to rescue a dog). Like yours truly, Scalzi is a liberal (with a lower case l); clearly, our opinions running the same frequencies goes a long way into explaining why I like him (and his writing) so much. Overall: He might have gone back to his least interesting set piece, but his writing is very much still there. The Human Division ranks a very tasty 3.5 juicy crabs out of 5, and that's after taking back half a kadam to dishonour the lack of an overall ending. So now you mix kadams with crabs? What’s will you add to the mountain dew? Midichlorians? I’m also not that excited about going back to the OMW universe. I’ll save it for a rainy day. That's your complaint? I thought you'd point out the inconsistency of me pounding the hell out of previous endless books I've reviewed. Anyway, Human Division is not a bad option for a rainy day. Easy and highly entertaining.